Making Cottage or Curd Cheese without rennet etc. Cheese has always been a way of storing a surplus of milk for use when the cow or sheep were dry and making your own cheese at home is a great way to store any surplus milk you may find yourself with. In terms of cost, home made cheese will not save you money but if you find you have a couple of pints about to turn in the fridge or the supermarket has over stocked and reduced some milk, you can store this by making cottage cheese. Although cottage, or curd cheese as some people call it, doesn’t store for a long time in the fridge it will freeze easily. All cheeses are made from the coagulated lumps from milk – the curds – with the liquid part called the whey, hence curds and whey. Although a lactic starter can be used when making cottage cheese, it is not absolutely necessary, the same chemical reaction of turning the milk, or curdling, can be obtained from the use of vinegar or lemon juice which most people have in their kitchen. 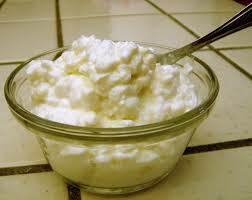 So why not spend half an hour making your own cottage cheese? It tastes better than shop bought and the process is absolutely fascinating. Pour the milk into the saucepan. Heat on hob until it is very hot, but do no boil, stirring occasionally with a wooden spoon. Add 2 tablespoons (30 ml) of lemon juice or vinegar. Stir and watch the hot milk separate into the curds and whey. Pour the curds and whey through a sieve to catch the curds. Discard the whey or use it instead of water in bread making, or for any recipe calling for sour milk or buttermilk. Transfer the curds into a small bowl and add a pinch of salt. Add a tablespoon of double-cream to the curds for a richer consistency. Add chopped chives, chopped spring onions, herbs. If the milk is not curdling it may be the milk. Only use regular pasteurised milk not UHT. Add a little more acid in the form of lemon juice or vinegar to correct.